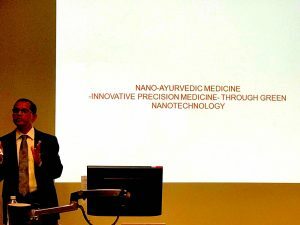 Our association, Australasian Association of Ayurveda Incorporated (AAA) was going through a transition phase when I received an invitation from Royal Melbourne Institute of Technology (RMIT) nano-technology department, for one of the lecture that was going to happen in RMIT in October. Neither of us was aware that this lecture from Dr Kattesh Katti (PhD) will lay the much needed foundation stone for Ayurvedic research activities in Australia. Our association members had a meeting with Dr Katti and Dr Shukla in RMIT followed by the lecture. We had a few meetings within the association before, to start some sort of research activities in Australia. We were considering making up a database for Ayurveda diseases and results achieved by our fellow Ayurveda practitioners with their experience in the field of Ayurveda. Ayurveda is a holistic medicinal system that originated in India 5000 years ago and whatever is written in Ayurveda texts is still found to be true and western science has not been able to challenge Ayurvedic medicine in its efficacy. There is a lot more scope for western medicine to learn from Ayurveda which is referred as “ Science of Life” because of its approach to disease prevention with lifestyle and diet as advised in Ayurveda texts and also treating the disease with diet and lifestyle modifications and use of yoga, meditation, herbs, minerals and metallic (nano-ayurvedic medicine) formulations. With Dr Shukla’s great knowledge and experience in the nano-technology research field and his great work on Gold nano-particles with help of his mentor Dr Katti from USA he acheived one of the much needed success in treatment of Prostate cancer. The trial is in it’s end stage waiting to reach to prostate cancer patients. The data shown in Dr Katti lecture was amazing and his description of scope in Ayurveda medicine and his team’s tremendous work on Nano-Ayurveda Medicine won the heart not only of Ayurveda practitioners attending the meeting but each and every person present in the lecture hall that included people from reasech graduates to director of research and also sponsors of some pharmaceutical companies. Dr Katti refrenced Ayurvedic medicine many times in his lecture and mentioned in details how this holistic science that lacks western way of quality control, evidence based approach and standaridization could help to cure many diseases that are beyond the reach of western medicine. He stated that Nano-Ayurvedic medicine products can be used to cure and treat patients across the world. Not only in Dr Katti’s words but his and Dr Shukla’s work also showed how close they have been working to this holistic medicine. Gold nano-particles discovered by him are also found in “Swarna Bhasma” but the percentage of gold nano-particles in gold bhasma is yet a matter of debate for us, being Ayurvedic physicians. Dr Katti’s work in Green nano-technology where he has used phytochemicals from mango skin, herbal tea and cinnamon, is closely related to Ayurvedic principles. He stressed on the need of “reverse engineering” where there is need to do animal testing to do its standaridization and reformulation so that Ayurvedic medicines can be used even in the western world to cure cancer, arthritis and many other debilitating diseases. I love to emphathesize on Dr Katti’s lecture one line that World Health Organization expect 80% of world’s population will move towards Ayurvedic medicine and other complimentary medicinal products as a primary source of healthcare. I believe God Dhanwantri (The Creator of Ayurveda) has showered his blessing on his birthday now officially declared as National Ayurveda Day in India. I am hoping this begining will lead to the path of success in near future with collaborative approach from RMIT team and my colleague Ayurvedic practitioners. I hope that Dr Shukla’s team and RMIT will collaborate with AAA to do significant research activities in the near future in the field of Ayurvedic medicine. This will definitely bring Ayurveda to a much higher level than where it is Today and create valuable alternative treatment options for not only cancer but also for various delibilitating diseases. I would like to thank on behalf of Australasian Association of Ayurveda Incorporated (AAA) to Dr Shukla and his team for their great work and giving us chance to have a talk with them . I would also like to thank Dr Krishna Kumar, Ex President of AAA; our mentor in Australia because of his efforts and hard work we all are working as registered ayurvedic professonals in Australia .